It was for the first time that the NGO Majak took a part in an international project dealing with racism and prejudice among football fans. Majak works with endangered teenagers in and around Liberec and the goals of the pro supporters action week was suitable for the kids, moreover for their friends. Majak cooperated with a regional NGO to cover a larger target group. During the project teenagers from Liberec, Frýdlant, Raspenava, Hejnice and Nové Město were involved. As it was planned, Majak organised various activities during the FARE action week. The project week dealing with anti-/discriminatory and anti-/racist manifestations among youth in the football community consisted of 5 actions, targeting teenagers 12 – 18 years from the fan community of FC Slovan Liberec. Majak issued and distributed 400 flyers dealing with approaches to tackle discrimination among teenagers and young fans, informing about risks of discriminatory behaviour and consequences that may follow. The flyer contained basic information about the FARE Action Weeks against racism and discrimination, the pro supporters project, its main goals and principles. Flyers were distributed in schools, during sport sessions, in football clubs of the participating cities and to the public. On Tuesday, 16th of October, Majak organised a football match between two drop–in centers for youth at risk. Over 40 teenagers took part and spent over 2 hours playing football on a grass field. After the match the young players and fans discussed the topics of ethnic – based discrimination in football. On Wednesday, 17th of October, the organisers screened a documentary about discrimination in football, how sport can unite different cultures and people from all around the world. The attendance was not so high, however more interesting and deeper discussions took place in the club that night. Some personal experiences from the fan community and others stories opened the topic of dealing with discriminatory behavior and its regulation. On Friday, 19th of October, a discussion panel was organised on the main topics of the FARE week. Tomáš Čarnogurský from the FC Slovan fan project presented the struggles of this problematic and discussed with teenagers about their own experiences with racism. Over 25 people were involved. On Saturday, 20th of October the main framework of the FARE Action Week and our regional pro supporters project was presented on a first league match between FC Slovan Liberec vs. FK Mladá Boleslav. To sum up, over 75 teenagers were involved in the project activities, all 400 flyers were distributed, and the project was presented to the public in 5 cities in the Liberec region. On Wednesday 24th there was a public debate about fascist music in the so-called “Ostkurvensaal” of the “Weserstadion” in Bremen. About 300 mainly young Werder supporters attended the event in order to exchange ideas how to deal with this issue. 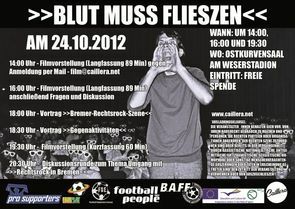 First the Werder Bremen fan club Ultras Caillera showed the documentary “Blut muss fließen” in the long version. This documentary shows undercover takes of fascist concerts. Furthermore, the film deals with the difficulties of people willing to work together with public instances, as e. g. the Federal Department of the Interior, in order to hinder such kind of agitation. The long version offers an additional insight into the European context of extreme right-wing music. Subsequently there was a lecture about fascist activities in Bremen as Bremen can be considered as a stronghold of fascist music with about 40 bands in the urban hinterland. A sound studio in Schwarme is producing their recordings for 10 years. At 7:30 the film was showed in a shorter version. In this after work presentation the European aspect was not covered. Yet the problems and success of fascist music was revealed anyway. 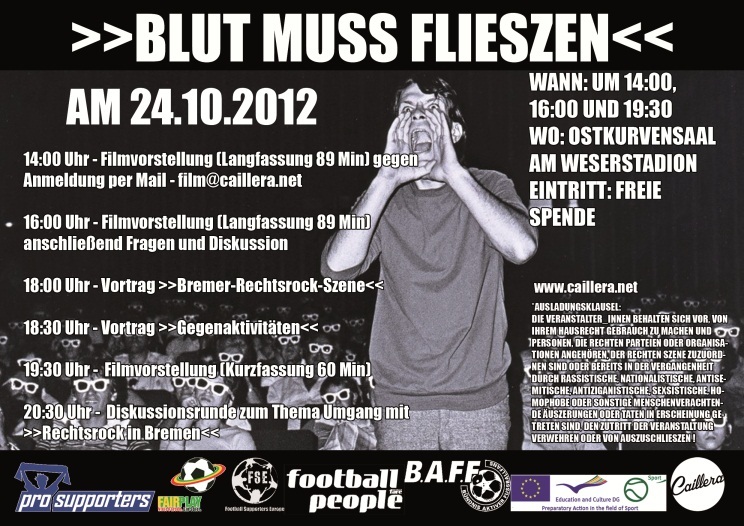 Subsequently there was an open discussion about both the neo-Nazi scene in Bremen and the documentary itself. The latter still received very little public funding like the case of the NDR (public media in Northern Germany) reveals. This channel showed a short report about the film including a recommendation. Yet they are not showing any interest in either financing or producing the film itself. Because of further presentations the authors are hoping for pressures urging public media to show the film in a larger context.The aim of the filmmakers remains to reanimate public documentaries in television. 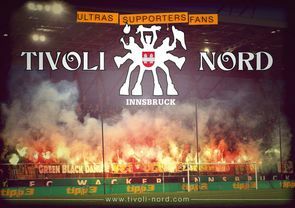 The FC Wacker Innsbruck and the fans of the Tivoli north stand are well-known for their commitment and actions against all forms of discrimination and the regular participation in the FARE Action weeks. 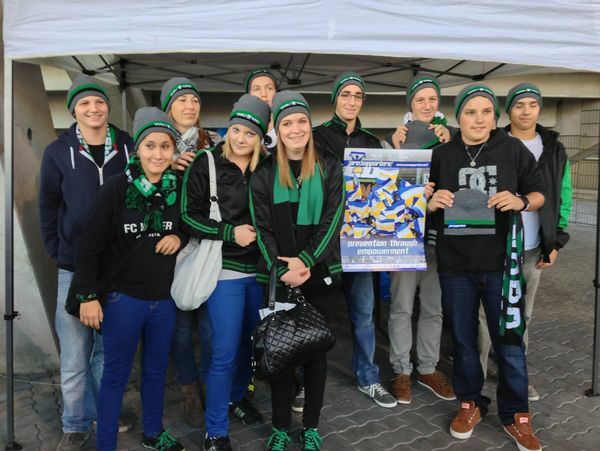 In the framwework of the pro supporters action week 2012, the members of the umbrella fans’ organisation Tivoli Nord took action at the match of the Austrian Bundesliga FC Wacker Innsbruck – SV Ried on 20 October. The members of the Tivoli Nord including fans between the age of 12 and 18 years set up an information stand at the entrance of the Tivoli stadium. 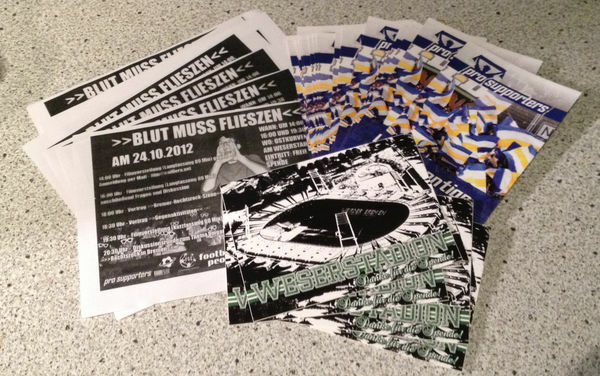 There they distributed 1.000 flyers that were especially produced for this occasion among the fans of the FC Wacker Innsbruck. The flyer informed about the pro supporters project and its aims and the support of the Tivoli Nord. Furthermore, a set of 100 wool caps with the slogans “Tivoli Nord” and „pro supporters“ were distributed exclusively to young supporters. The design of the wool hats was selected in the framework of a design competition for youngsters within the FC Wacker Innsbruck fan scene. The fans of the FC Wacker Innsbruck also produced a banner “„Immer schön wacker bleiben – Nazis aus dem Stadion treiben“ (“Always support Wacker Innsbruck- kick Nazis out of the stadium”) and displayed it at the start of the second half on the north stand. The FC Wacker Innsbruck joined the FARE action week by exposing a banner with the slogan “Football against Racism” on the pitch before kick-off. The stadium commentator and the vidi-wall informed about the FARE action week and the actions taken by the club and the organised fan scene. 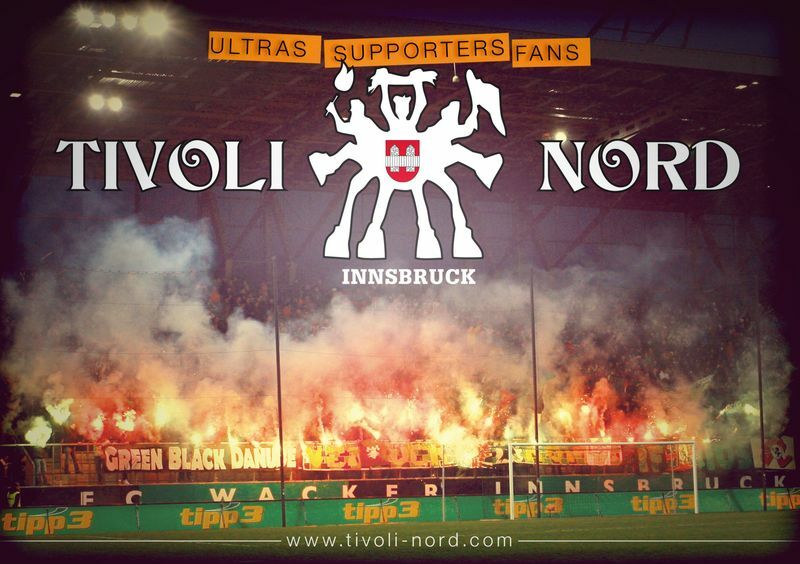 The websites of FC Wacker Innsbruck and the Tivoli Nord extensively informed about the pro supporters action week, so did their respective Facebook sites. In the framework of the FARE and pro supporters action weeks against discrimination in football the Fan-Initiative Innsbruck and Fanarbeit Innsbruck (fan project Fan Work Innsbruck) invited 35 young football fans from the refugee centre Reichenau to the Austrian Bundesliga game FC Wacker Innsbruck against FK Austria Wien on 10 November. Thus the FC Wacker Innsbruck and their fans are the only ones in Austria that organsied two actions against discrimination and pro supporters around the FARE Action Weeks at two different home games. The focus of this pro supporters action were „activities against racism, discrimination or homophobia in football with the clear aim to raise awareness and to fight against discrimination and exclusion of young fans between the age of 12 and 18“. The FC Wacker Innsbruck and the Fan-Initiative have been united for a long time in their attempts to tackle racism and discrimination. Thus, the refugee kids were welcomed in a hospitable way at the Tivoli stadium. The children not only enjoyed the game but received pro supporter posters from the Fan-Initiative and merchandise like scarves from the club. Furthermore, the members of the Fan-Initiative distributed several hundred flyers raising awareness to anti-racist and anti-discrimination issues and promoting the FC Wacker Innsbruck as a social, tolerant and inclusive football club. 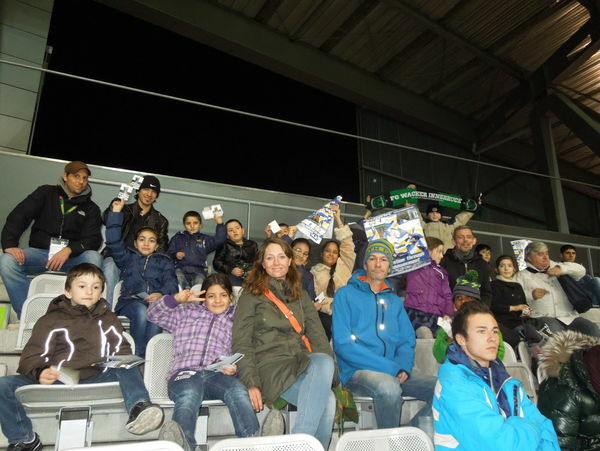 The official websites of FC Wacker Innsbruck and Fan-Initiative Innsbruck covered the pro supporters action with the refugee children at the Tivoli stadium. Fußball.kult.ur – Fanarbeit Lustenau and young fans published "Fanzine"
The fan project Fußball.kult.ur - Fanarbeit Lustenau organised the pro supporters action week in cooperation with the Austrian second league team FC Lustenau and the young fans of the fan clubs “Blue Freaks” and “Fanatic Youth” which represent the organised fan scene in Lustenau. The main aim of the action was to produce and distribute a “Fanzine” (fan magazine) in order to promote positive fan culture, explain the Ultra way of life and inform about the fan project Fußball.Kult.ur – Fanarbeit Lustenau and the pro supporters project at the match FC Lustenau against First Vienna FC 1894 on 26 October. 10 fans and the fan worker set up an information stand right after the only entrance of the Reichshofstadion in Lustenau. There they had the possibility to reach all 1000 spectators that attended the game, talk to them and hand them out the glossy Fanzine and further material about the FARE action weeks such as posters, stickers and balloons. At the beginning of the game the fan clubs organised a choreography with a huge writing “Lustenau” and with the blue and white balloons with the slogan “Vorurteile platzen lassen!” (“Let prejudices burst!”). The stadium commentator informed about the FARE action week, the kids that accompanied the players wore T-Shirts and put up a banner with the slogan “Vorurteile platzen lassen!”. Furthermore, the two captains of the teams read out messages against racism and discrimination before kick-off and received applause from the spectators. Then all the players and the fans let the balloons burst in order to send a strong message against prejudices. The FAI’s Intercultural Football Programme engaged with Show Racism the Red Card to identify relevant clubs to work with. Show Racism the Red Card worked with two interested clubs who agreed to target their fare week work activities specifically at young fan and potential new young fans. Ran a “Design a Flag Competition” during October for fare Week which was aimed at St Patrick’s Athletics’ younger fans and members of the youth section. The Club advertised the competition on its website, facebook/twitter and gave information to kids in 4 different schools that the club runs community coaching programmes in. 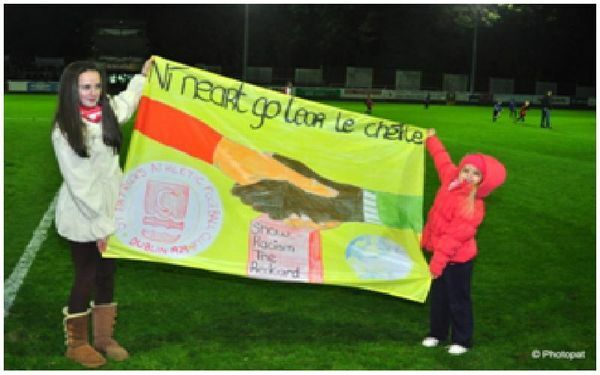 The competition had many entries from children of all ages who drew pictures incorporating the St Patrick’s Athletic brand and Show Racism the Red Card the pictures were then converted into a flag. The other entries to the competition were hung in the media centre of the club at half time. The winning flag was presented at half time on the pitch and it was hung in the stadium for the rest of the match. There were also regular PA announcements about the competition. The club felt that it was a very well received competition and would be happy to run similar competitions throughout the following season. Dundalk F.C. focused their activities during fare week at the home match Dundalk FC v Bray Wanderers, on Friday 26th October 2012. The club invited Ethnic Minority groups from Poland, Lithuanian, Lativa and Africa to attend the match giving out 300 free kids tickets to attract these communities, with approx 20 to 30 people from the Polish, Lithuania and African community attending the match, the club had Polish and African music playing before the match and at half time, with food stall in the Enda McQuill suite which was full of tradition Polish and Lithuanian food. The girls in the picture who walked out with the team are representing the Polish and Lithuanian. The pictured are the Polish and Lithuanian children that attended the match.